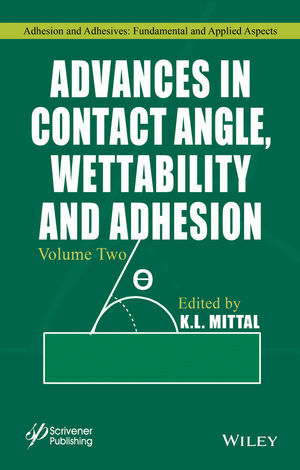 This book is the second volume in the series "Contact Angle, Wettability and Adhesion." The premier volume was published in 2013. Even a cursory glance at the literature show that in recent years the interest in understanding and controlling wetting behavior has grown exponentially. Currently, there is tremendous research activity in rendering surfaces superhydrophobic, superhydrophilic, superoleophobic, superoleophilic, omniphobic and omniphilic because of their applications in many technologically important fields. Also the durability or robustness of materials with such super" characteristics is extremely significant, as well as the utilization of "green" (biobased) materials to obtain such surfaces. This book containing 19 articles reflects more recent developments in certain areas covered in its predecessor volume as well as it includes some topics which were not covered before. Concomitantly, this book provides a medium to keep abreast of the latest research activity and developments in the arena of contact angle, wettability and adhesion. The topics discussed include: Understanding of wetting hysteresis; fabrication of superhydrophobic materials; plasma treatment to achieve superhydrophilic surfaces; highly liquid repellent textiles; modification of paper surfaces to control liquid wetting and adhesion; Cheerios effect and its control; engineering materials with superwettability; laser ablation to create micro/nano-patterned surfaces; liquid repellent amorphous carbon nanoparticle networks; mechanical durability of liquid repellent surfaces; wetting of solid walls and spontaneous capillary flow; relationship between roughness and oleophilicity; superhydrophobic and superoleophobic green materials; computational analysis of wetting on hydrophobic surfaces: application to self-cleaning mechanisms; bubble adhesion to superhydrophilic surfaces; surface free energy of superhydrophobic materials; and role of surface free energy in pharmaceutical tablet tensile strength. Kashmiri Lal Mittal was employed by the IBM Corporation from 1972 through 1993. Currently, he is teaching and consulting worldwide in the broad areas of adhesion as well as surface cleaning. He has received numerous awards and honors including the title of doctor honoris causa from Maria Curie-Skłodowska University, Lublin, Poland. He is the editor of more than 115 books dealing with adhesion measurement, adhesion of polymeric coatings, polymer surfaces, adhesive joints, adhesion promoters, thin films, polyimides, surface modification, surface cleaning, and surfactants. Dr. Mittal is also the Founding Editor of the journal Reviews of Adhesion and Adhesives.